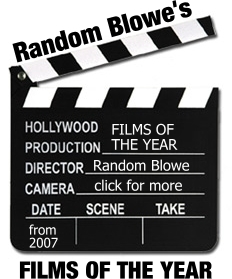 Random Blowe: Why Is It So Hard To Find Out About The 'London Race and Criminal Justice Consortium'? Why Is It So Hard To Find Out About The 'London Race and Criminal Justice Consortium'? Every now and then Lee Jasper, once the Senior Policy Advisor on Equalities to former London Mayor Ken Livingstone, pops up in the press speaking on behalf of something called the “London Race and Criminal Justice Consortium” (LRCJC). Most recently it was in this article on the terrible experiences of one young man who had been repeatedly stopped and searched by the Metropolitan Police, but Mr Jasper has been quoted as its Chair in national press articles on racism in the Met, race in Britain in 2012 and the racist comments of David Starkey. After Friday's piece by Guardian journalist Diane Taylor, I started to wonder: who are LRCJC's members and what work does it actually carry out? I have been an activist campaigning in London on racism and policing issues for 20 years but know absolutely nothing about it. I asked some activist friends with similar interests and contacts but they were equally mystified. A Google search failed to find an LRCJC website and every reference to the 'Consortium' seems to relate directly to a Mr Jasper personally. I did learn, from a article by Operation Black Vote, that back in 2010, LRCJC could be contacted via www.leejasper.com and it planned to “represent organisations such as Metropolitan Black Police association, Society of Black Lawyers and RESPECT the black and ethnic minority prison staff association”. But there was nothing more illuminating than that. Moreover, there are a number of organisations carrying out excellent work on the misuse of stop & search powers – nationally, Stop Watch in particular and at a local level, groups like Newham Monitoring Project. 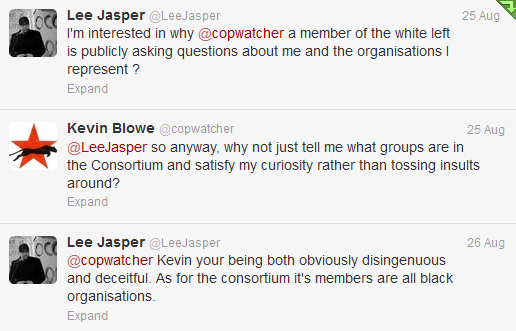 I wondered why the Guardian hadn't asked one of them for comment, rather than the chair (albeit a well-known, high-profile one) of an apparently obscure organisation. Stuck for answers, I put out a fairly sceptical request for information to followers on Twitter, asking if anyone knew more about LRCJC. Despite a further prompt, no-one replied and, with more interesting things to do over a busy Bank Holiday weekend, that would probably have been that. However, Lee Jasper then got in contact via Twitter and his reaction to a simple question was so combative and evasive that I was suddenly really interested to know why he seemed so concerned about it. 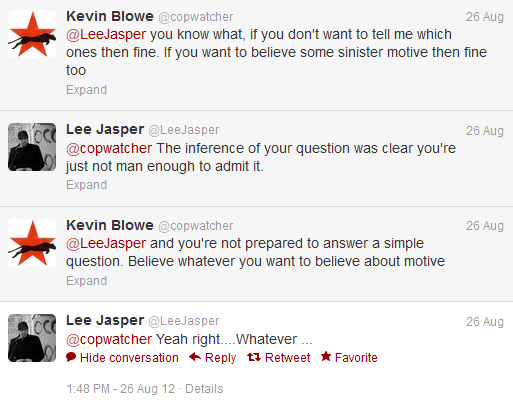 Jasper demanded to know why I was publicly asking for information about LRCJC and why I hadn't contacted him personally. I guess the latter is a fair question but it had never occurred to me to approach someone I don't really have a great deal of respect for and who I probably haven't spoken to since the early 1990s, although activism circles are fairly small. For a decade I helped organise the United Families & Friends Campaign (UFFC) with custody death families but until 2008, Mr Jasper was still working at City Hall, busy praising the senior officer in charge of the botched operation that shot and killed Jean Charles de Menezes at Stockwell station (taking a lead from his boss). So it's not as if we are remotely close (I don't even follow him on Twitter). Just as importantly, what exactly is wrong with publicly asking about the membership of LRCJC when it is quoted regularly in the press? I am really looking forward to Mr Jasper's blog post, if it ever appears (I guess this article may feature, as he mistakes 'sectarianism' for 'not accepting his word at face value'). But I'm still no clearer about who the 'London Race and Criminal Justice Consortium' actually represents or what work it has ever done. In the circumstances, it therefore seems only fair to conclude that – at best – the LRCJC is nothing more than a name, a paper network of groups that Mr Jasper has links to (what the 'white left' might call a 'front organisation'), with no real purpose other than getting his name into the press. If, however, the LRCJC is not a 'front' but a genuine consortium as Mr Jasper insists, then perhaps he can outline what actual work its members have together carried out on stop and search, or on last summer's riots, or in providing practical support to black students during recent student demonstrations? Other than speeches by its chair and sole spokesperson, what proposals have LRCJC members collectively developed on, say, the changes to the Educational Maintenance Allowance that have negatively affected so many minority students at FE colleagues? What campaigning has it organised against, for example, the abuse of anti-terror laws? What work, indeed, has the 'Consortium' ever undertaken on anything? Lee Jasper once held a high-profile public position and as an individual, I'm sure he has an interesting point of view on some issues. That doesn't mean he speaks for anyone else but himself. So why don't journalists just ask him to comment in an individual capacity? Why insist on quoting him as a spokesperson of a grandiosely named 'Consortium' that sounds as if it might genuinely represent a wide range of opinion, when there is little evidence that it even exists? Equally, why does the press insist on doing this, when there are plenty of other respected organisations with a proven track record of casework, research and campaigning on issues around racism or policing? Wouldn't it be more interesting to readers to speak to people in a position to offer something far more helpful than a few words of outrage? 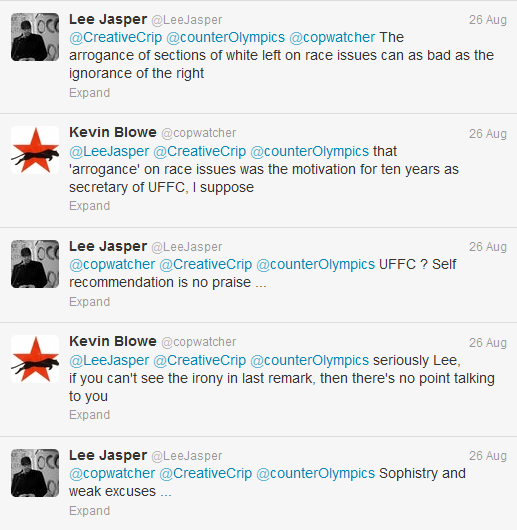 That Lee Jasper even uses a phrase like 'the white left' tells you all you need to know about him. He's made a career out of divisiveness and has never represented anyone but himself. How can someone who is rude, get a job City Hall? This very misleading and misguided article is attracting all the wrong sort of comments. Why should Lee Jasper answer to you? Fact is you sound a little miffed you're preferred organisations did not get mentioned in the press. I bet NMP and UFFC don't want to get to dragged into this silly debate so its quite wrong of you to try and justify you're comments with reference to them. Alot of people would like to know what this organisation does. All we can see is that lee sits on twitter all day scouring the Internet for news stories that he can retweet to highlight racism that often isn't there. I wanted to add that there is probably also of good that lee and his organisation could do for the community like encourage more role models promote importance of education etc but he just seems to be a bit of a whinger and wants to blame everything on police and government rather than address some of the important issues that impact his community. You're wasting your time Kevin, he's a one man band who doesn't want you knowing that and asking further questions about funding etc. 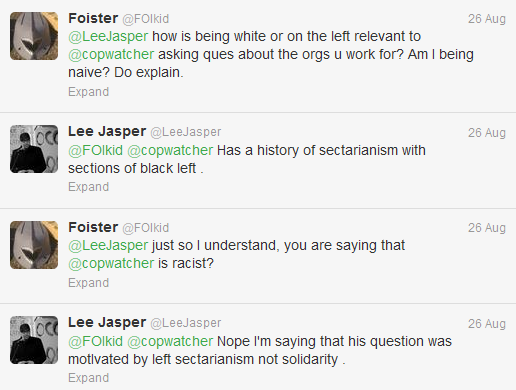 I keep looking at Lee Jasper's blog for the promised post on Kevin's supposed 'history of sectarianism with sections of black left' but it never appears. I can therefore only conclude that, like the “London Race and Criminal Justice Consortium”, it is a figment of Mr Jasper's imagination.